There are times that I want something mild and creamy. Something…, if you allow me to say, “bland”? I like rice cakes. 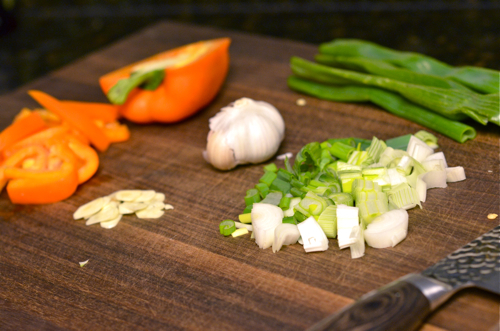 I make soups, stir fries, even deep fries with them. Typically Koreans make rice cakes with spicy chili paste but due to the recent fusion culinary trend in Korea, you can get quite creative with these guys. 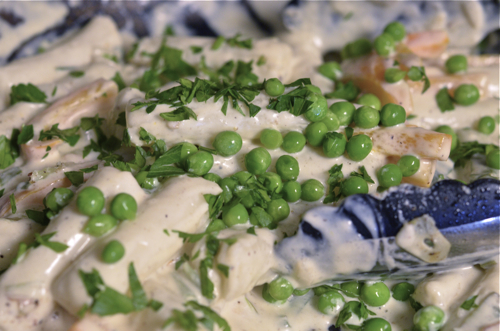 So I made this ultimate “stomach comfort” dish that can sooth your soul as well — with cream sauce that you will love!! 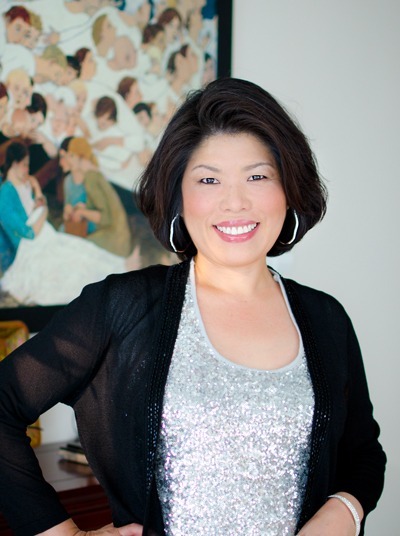 !Rice cakes are NOT your weight watcher’s dream food. But, please, don’t let my warning to discourage your desire of trying this recipe. Eat and run 2 miles around your neighborhood afterward. Here is the castings on “snow white forever” episode 1. First thing first! 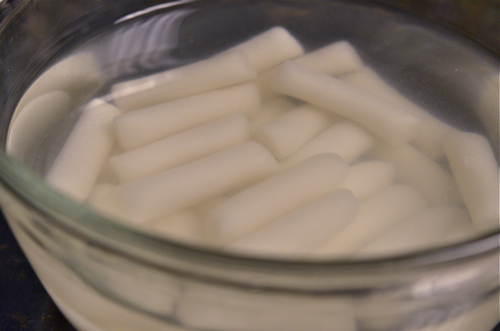 Soak rice cakes in water. If your cakes are freshly made–no need to. There is nothing like watching your piggies curling up in your frying pan. Just fry the bacon until tender crisp. Remove from the pan. You will see lots of bacon fat left behind. Just use paper towel to soak them up, but leave about 1 Tbsp in the pan though. I used Vidalia sweet onion but you can use leek (only white and light green part). Saute onion and garlic in the reserved bacon fat until tender. Season these guys with salt and pepper along the way. Add your snow whites and fry 1 more minutes. Pour half and half, and let it thicken over medium heat. They thickens quite fast since rice has lots of starch. 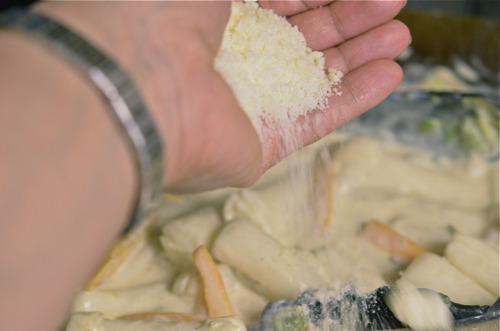 When the sauce get slightly thicken, add Parmesan cheese or Romano cheese. 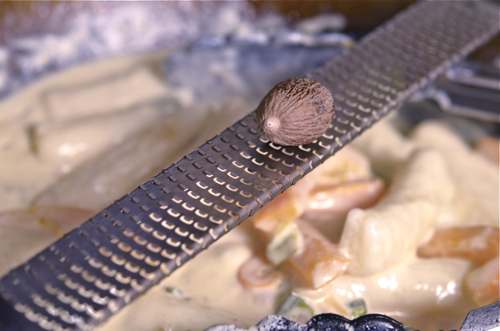 Adding a dash nutmeg is an optional but you will love what this adds to the flavor in the cream sauce. At last throw some peas and parsley. Gotta eat vegetables…! Sprinkle the bacon pieces on top when you serve. plus the crunch salty bite from the bacon! but don’t look at your tummy afterward. Just remember my comforting word to you. 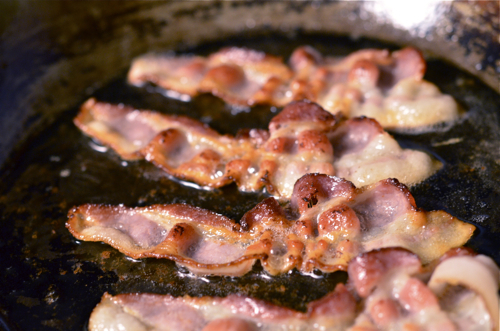 In a skillet, cook bacon until crisp tender. 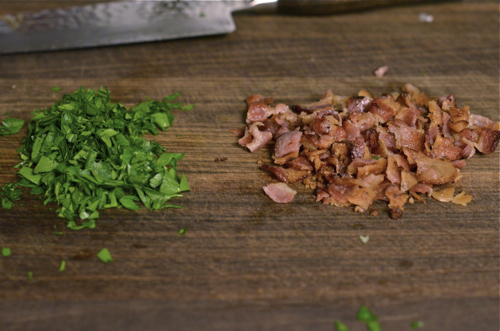 Crumble or chop the bacon to small pieces, set aside. 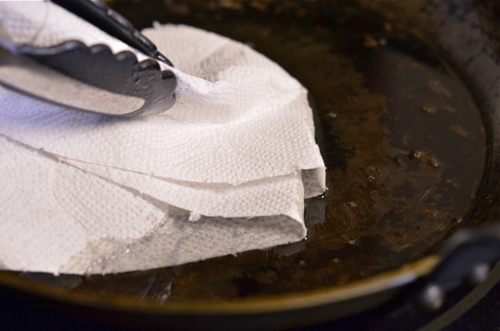 With kitchen paper towel wipe off bacon fat but reserve about 1 Tbsp of fat in the skillet. 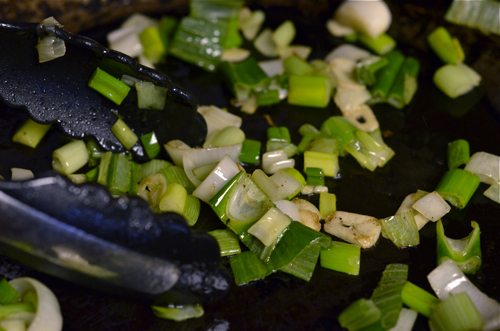 Add onion and garlic to the skillet and saute until tender over medium heat. 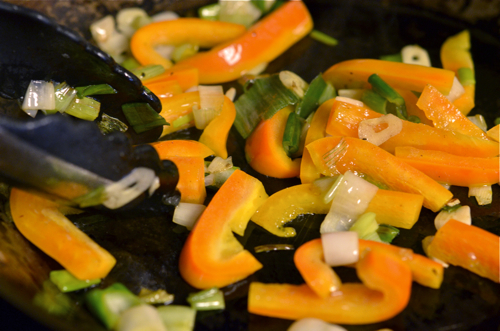 Add bell pepper and continue to saute for another 2 minutes, seasoning with salt and pepper. Add rice cakes and cream and let them cook until the sauce gets thicken, stirring occasionally. Add cheese and nutmeg, stir to combine. Season with salt and pepper if needed. Add peas and parsley, toss well. 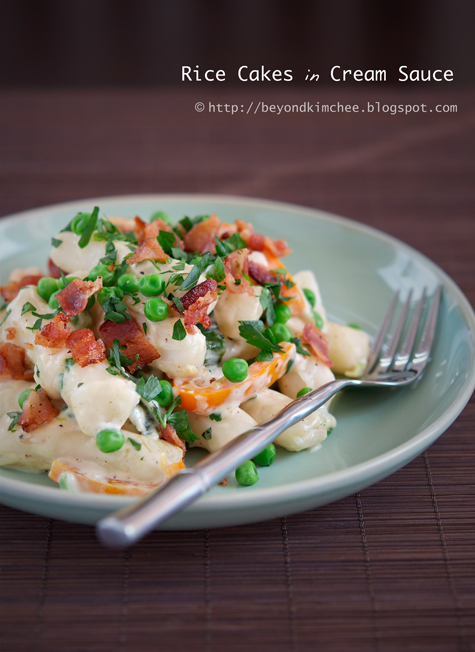 To serve sprinkle bacon on top of rice cakes along with more parsley and peas if you like. oh this looks and sounds so good! it's almost like a pasta carbonara but made with ddeok instead of pasta, right? what a great idea to fuse those two! Holly - This really is a brilliant idea. Looks amazing! Those long tteok noodles are so versatile. They look and taste good in nearly any kind of sauce. Mirror mirror on the wall...who's the most delicious of them all? Really, really, really cool idea! this is genius. It's just like a gnocchi dish, but instead of potato dumplings, you're using rice dumplings... hey why the heck not, huh? Loving the fusion vibe... right up my alley. ha ha ha! I love that. Thanks! It really is. 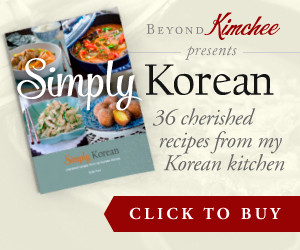 I have tried rice cakes immersing with different types of cuisine and it all worked great. I love rice cakes. Sort of... 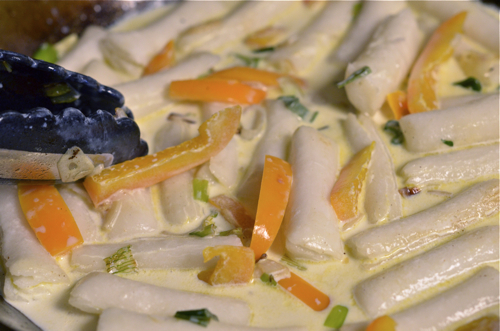 The idea of putting rice cakes in cream sauce is well known among Korean cooks due to the serious fusion style trend. I just made my version with half and half instead of heavy cream and added nutmeg and bacon. I think bacon goes with everything regardless of any cuisine. Yes, it is. 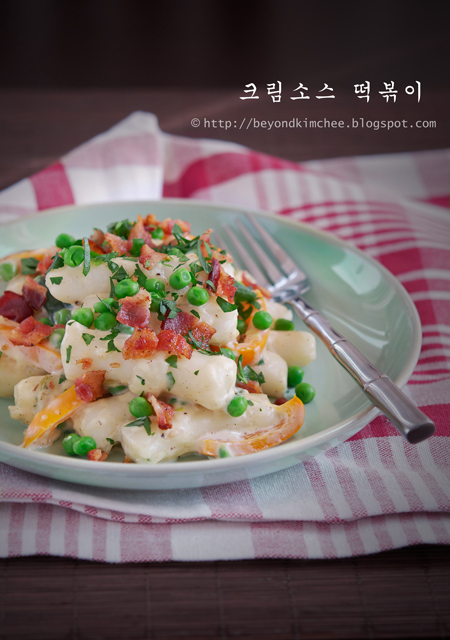 I think any body who enjoys pasta carbonara can make this dish. me too! i'm loving this western approach to asian dishes! marries the best of both worlds! This sounds and looks like a wonderful fusion meal...!! I love rice cakes and I love creamy sauce. Combining both couldn't go wrong in my eyes :D). 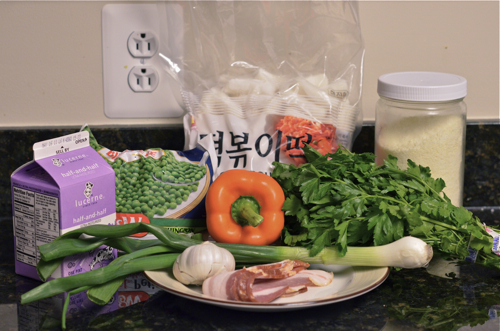 I did a 12 days of tteokbokki theme last year for Korean New Year. That ruined my low carb diet for some time! LOL!